January comes and with it an end to the Christmas festivities. The short days and cold temperatures begin to wear on us. As we put away the Christmas decorations and settle in for a few more months of winter, the Church changes seasons, to ordinary time. The ordinary days of winter feel barren, boring and a bit dreary. We instinctively look forward to spring, or plan get-aways to sunny climates to escape the snow. There doesn’t seem to be much to appreciate in the here and now. If ordinary time is so inconsequential, why do we have so much of it in the Church? Is it a placeholder between the more exciting seasons of our faith? Or is it something more? The drab days of January chafe against the grand new year’s resolutions we have just made. 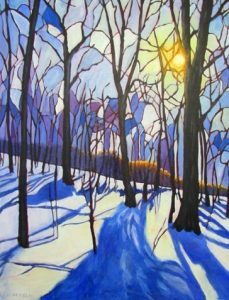 Our plans and ambitions for greatness and achievement are met with the monotonous routine of winter days that do not celebrate our glorious intentions, but rather seem to try to fold them into the flow of time that continues within our daily duties. January refuses to be our cheerleader, and we are left to fight against the current of daily life, or find a way to adjust our perspective so that we have a reality that is coherent with the world around us. Ordinary time has a hiddenness to it. Like the 30 years Jesus spent in ‘ordinary life,’ there is a value below the surface of the daily routine and cold winter days. Ordinary time teaches us to find the sacred in each moment of our lives. January is full of the duties of the present moment that begins before the sun rises. The gift of January is hidden in those moments. It’s seeing God below the surface. 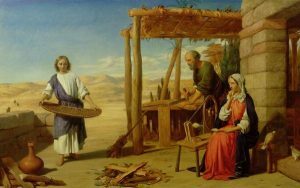 He comes to meet us in sacred ordinary time, and in those moments, we don’t go out to join him in celebrating the mysteries of his incarnation like we do in other liturgical seasons. Instead, he comes into the dark and ordinary moments of our lives to reveal his presence in our realities, to share our lives with us. In winter we learn to live the maxim of St. Theresa of Calcutta to do little things with great love, discovering Love himself who is in those little things. The Gospel lives in the midst of our routines- in the midst of the life God gives us with all the duties and sometimes monotonous circumstances it presents. Discovering Christ active in those moments unites us with him. In January, we can like Christ, rise before dawn to spend time with the Father. We can examine our hearts to see if the soil he sows Himself in is rocky or thorny, and needs to be tended to welcome him more receptively. We can let him heal through us through a smile at the office, a loving word to a child, an effort to ease someone else’s burden. 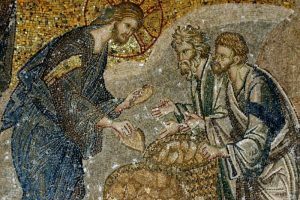 We can feed the 5000 (or however many children you have) with him, making grocery shopping, cooking and clean up sacred, an imitation of the Gospel moment. We can bear the insults and crosses that come with a burdened people, slugging through the winter, and respond with love and graciousness. 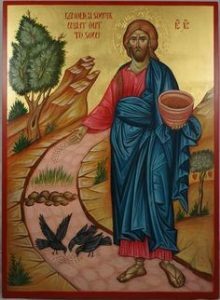 We can meet our friends who have wounds they would only show Christ through us, at the well or over lunch or at the coffee shop, and offer them Him who will heal them and quench their soul’s thirst like the Samaritan woman. 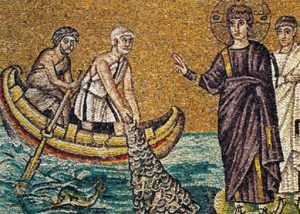 We can follow Christ in casting our nets, whatever nets he gives us, and seeing the surprising bounty he brings through it. 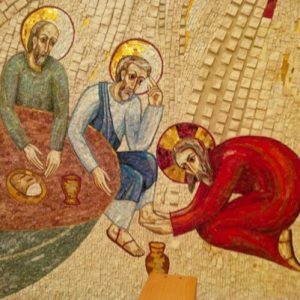 We can wash the feet of those around us with Jesus, serving them in ways that honor their dignity and show them that they are loved. In sacred ordinary time, the Gospel meets us in our lives. Each moment, when we are docile to what God asks of us, becomes an encounter with Christ in which we live our day together with him. Sacred Ordinary time is an extraordinary gift. It’s a time to learn to listen to and follow the rhythm of the silent music of the Holy Spirit in our lives and to live the holiness of each moment joyfully, knowing Christ is here, living it with us. That we know where it will lead. And above all not to be stiff. About the steps that you choose to take. And pick up the rhythm of the music through you. But allow ourselves to be spun, to be moved to the side. We have to know how to pause and slide, and not walk. If they were not in harmony with the music. In the joyful ball of your love. When we would prefer to sleep. That they knock the wind out of us. Knowing well that that’s the sort of thing that happens when you’re dancing.